I'm here today with a cool book that just came out today, Hex Hall by Rachel Hawkins. 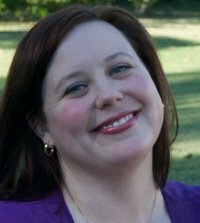 I've got a review, a guest post from Rachel about the names of her characters, and a contest, so go ahead and dive in! Sophie has known she is a witch for three years now, and has been dealing with it surprisingly well considering she has a human for a mom. But when a love spell for a fellow classmate is botched, her estranged warlock father decides she'd be better off at Hecate, known as Hex Hall to its students. A reform school for shapeshifters, faeries, witches, and warlocks, Hex Hall is not where Sophie wants to be. Especially since a series of mysterious deaths all seem to be the fault of Sophie's only friend and only vampire at Hex Hall, Jenna, and three beautiful and spiteful seem bent on getting her to join their coven. And that's only the beginning of the trouble Sophie will have to face. 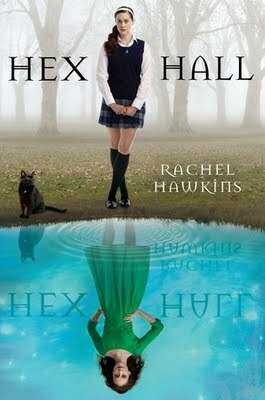 I was skeptical about Hex Hall at first (the magical boarding school angle has been nearly run into the ground), but Rachel Hawkins' quick wit and Sophie's easygoing and charming voice quickly won me over. Hex Hall is a funny and fast-moving read that manages to be unique and entertaining amongst the many paranormal books out right now. Hawkins' pacing is perfect: never too fast, but just steady enough to keep you involved in the story and all of the drama that Sophie is experiencing, which is a nice balance between boy and friend issues, a mystery concerning her father's background, being bullied by the three most powerful girls in school, and the fear surrounding the mysterious deaths on campus. This is an excellent, fun read full of twists and betrayals; Sophie's magnetism will draw in plenty of fans, and will have you rooting her on from page one. Hax Hall is a great read for those who might be a little young for the House of Night series, but will appeal to teens of any age. Cover Comments: I do like this cover! It's bright and unique, and I think it captures the mixture of fun and intensity this book conveys quite well. I love the misty forest and the bright blur pond--very fun! The title's font is awesome, and I think this will be one book that will stand out! Sophie, Sophie, Bo Bophie, Banana Fanna Fo Fophie...SOPHIE! Ah, the name game.I remember being so proud of myself when I finally learned how to sing that song in, like, 3rd grade. And I also remember my class trying to con our music teacher into letting us sing it with the name "Buck." Good times. Coming up with the perfect name for a character can be a challenge, so today, I thought I'd talk about how I came up with some of the names in HEX HALL! Ah, Sophie. The only name that came easy to me. I knew when I started writing that I wanted my main female character to have a strong, goddess-y type name. We love goddess-y names in our house; my husband REALLY wanted to name our baby Artemis before we found out it was Small Son and not Small Daughter. Anyway, my goddess-y names were kind of limited to Diana and...um... yeah, see what I mean? So I went the Gnostic route and named her Sophia, or Sophie. Her name means "wisdom" and (MAJOR OVERSIMPLIFICATION AHEAD!) she was sort of like the most human of the divine beings in Gnostic mythology. She "fell" and in doing so created the material world. I kind of love that. A god who messes up and in doing so creates humanity. (Also, Sophie's mom's name is Grace. Not an accident, that) Not that my Sophie is that awesome, of course, but it's as good a name as any for a girl who struggles with the "divine" nature inside her. Plus, I really, really loved Howl's Moving Castle, and sweet, stubborn, brave Sophie who is that book's heroine. I gave her the middle name Alice- also her great-grandmother's name- after my favorite female character in all literature, Alice from Alice in Wonderland. As for Mercer... that just came to me. Fit well, sounded good, moving on! One day I will write an entire post on Archer and how he was such a gift from the writing gods. I really hate when writers say, "Oh, this character just appeared and took over the story! He/She wouldn't do anything I told him/her too!" I always find this a bit...precious, I guess. I create my characters; they do what I make them do (And in this way, I am GRAND EMPRESS OF THE UNIVERSE! MWA-HAHAHA!) But it is true that sometimes your Muse just shoves this character into your book who is so much better than whoever you had initially, and that was Archer for me. He just seemed to spring onto the pages, leaning against a tree, saving Sophie from a werewolf, and snarking with the best of them. Poor Jenna. She started the book as a happy, ditzy Faery Princess named Lexie Cross and became loner, angst ridden Vampire, Jenna Talbot. Her transformation from Faery to Vamp had to do with plot purposes (I had to have everyone hold Sophie's roommate responsible for a series of attacks. Initially, people blamed Faery Lexie because she had a Vamp boyfriend. Then I realized that- DUH- the plot would be a helluva lot easier if LEXIE were the Vamp. Sigh. Occam's Razor and all that. But about the name. She got the Cross ripped away from her when Archer came in the picture, so I gave her Talbot because I'd once taught sisters with that last name. Then I realized I had a lot of "ie" names in the book, so Lexie had to go. I decided she needed a very simple, all-American name, and Jennifer- Jenna- she became! Another easy name. I don't watch The Hills (it makes me feel sad. And angry. And old. They drink Red Bull for fun. That's a generation gap, right there.) However, I DO read the recaps on Television Without Pity, as they are snarky and fun. Apparently, there's a girl named Elodie somewhere in there. I just loved that name ( "like Melody without the 'm'" as Sophie comments ) It's pretty and flowy, and like Archer, it sounds rich. "Parris" was the last name of one of the main Salem Witch Trials accusers, and since the SWT feature in my mythology, I wanted to use it. No first name for you, Cal! I know it, but I'm not quite ready to reveal it yet. Now, when you read HEX HALL you will think, "Wait... didn't Rachel say in that rambling blog post about names that Cal was a main character? He's in, like, three scenes. And he only talks in one!" To which I say, don't worry. Cal comes back in a BIG way in Books 2&3. Anyhoo, I did the whole "last name only" thing because I love it. I picked Callahan because it's a great last name. That and Shannahan are my two favorite last names ever. Well, those and LaFrance, which is the last name of a friend of mine, and AWESOME. When I was a teenager, there was a family we knew named Shannahan and I full on wanted to marry their son even though I NEVER MET HIM. I just wanted to be Rachel Shannahan. Oh, well. Hawkins ain't so bad. Now, contest time! I have one Hex Hall t-shirt to give away. Just answer this one question in the comments to be entered to win: Which Hex Hall supernatural creature would you rather be, a faerie, a shapeshifter, vampire, or a witch/warlock? This contest is for US residents only and will run until March 15th! Good luck, and thanks for reading! Based on the book Hex Hall (which I loved!) I'd wanna be a witch! It seems like a lot of fun. Great review and post! For me, I would rather be a witch for sure. I would love time travel spells (oh, the tests I would've aced if I only could). I haven't read Hex Hall yet, but oooh being either a witch or a shapeshifter sounds like a lot of fun, from my knowledge from the Harry Potter world! I think I'd want to be a faerie. Their whole world interests me. And I've already got the conniving thing down. ;) I LOVED Hex Hall and the tshirt looks awesome! Great review. I'm planning on getting this when it's released in the UK in April. Love the name game thing. Elodie is a fantastic name! Can't wait to read this book! I'd definitely want to be a witch. A faerie for sure! Faeries are just absolutely amazing. I love their world! The shirt looks fantabulous! As for me, I would want to be a faerie. They seem so much more "fun". I'd have to say a witch because in the book they're the only ones that seem like they have any kind of cool powers. easy question! a shapeshifter for sure. I could play tricks on people. What fun! A witch because it would be fun to be able to cast spells! =D But then again, a shapeshifter sounds really cool. Reminds me of Mystique from X Men. LOL! I'm a huge fan of all, but I would have to choose a shapeshifter. Great post! After reading all about their names, I'm wishing I had ordered this book sooner! Ever since I read the Animorphs books I've wanted to be a shapeshifter... but I wouldn't want to be restricted to one animal! I will definitely want to be a with to be able to do magic. There are many possibilities there. I love the Hex Hall t-shirts so simple but pretty. I hope I win. I want to be a faerie! Great review! I've heard a lot about it, but this is the first review that I've seen. I might have to check this one out!